Turn Any Window Into a Greenhouse! Grow Herbs in Your Kitchen Windows! • Fully assembled and ready to hang. Cables are 1/16" stainless steel (almost invisible). • Hang 1, 2, 3 or 4 modular plexiglass shelving units on strong cables, fastened to each end of a right-angle bracket mounted over the top of your window molding. Each shelf holds up to three plants. 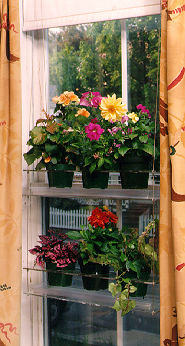 Hang up to twelve plants of different size in one window. Shelf Size: 19 1/4" x 6". Cable capacity: 120 lbs. • Slide Shelves up and down cables as often as you wish. Just loosen the clamps under each shelf, reposition the clamps and re-tighten. • Add or subtract shelves as the seasons and your design needs change (see pictures). • Easily add additional lengths of cable. • Shelves are either a single layer of plexiglass if they have a humidity tray and no holes for pots, or they are double layers of plexiglass if there are holes for pots in the top layer and a separated lower layer with a humidity tray. The bottom half of a Double Layer Shelf is always a Single Layer Shelf. Easily switch the top half of a Double Layer Shelf from holding three small 4"-4.5" plants like herbs, African Violets, ivy and cactus to holding two larger 5"-5.5" plants. 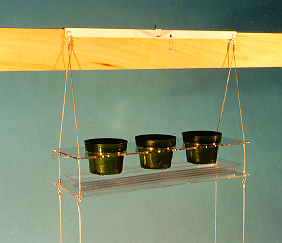 Use a Single Layer Shelf for Bonsai, tray designs, orchids, bulbs and other larger plants 5"-8". • Double Layer Shelves easily change into Single Layer Shelves, and vise versa. • Professional "pour-through" watering: no need to move plants for watering; watering is quick and easy; no collection of water in pots; drip through water automatically collects in humidity tray; end water marks on rugs. 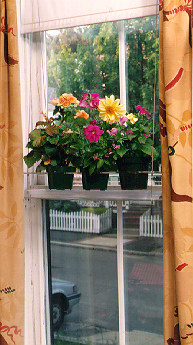 • Plant hangers need only one nail at the top of the window molding; this hole is not visible. Hold up to twelve plants with just one finishing nail. • Slip bracket off finishing nail and move unit to different windows as seasons or design needs change. Also use plant hangers on room dividers and porch and ceiling beams. • Plants in Double Shelves won't blow over, or tip over from accidental knocks by cats. • Plants get all the light they need. • Easily open and shut windows, or raise or lower shades. Plants are kept a safe distance from cold window glass. • On wide picture windows hang two or more units, side by side. • Shelves are made of sturdy, optical quality, 1/4" plexiglass. Each shelf is then flame polished by hand. This process produces the best looking product. • Order our flexible Starter Kit or, alternatively, measure the distance from the top of the molding to where you want the bottom (lowest) shelf to be. Tell us this length and we will make the cables to match this number. Growing Plants indoors is very easy if you give your plants enough light and enough water, but not too much water. You also need to give pants enough humidity and keep them a safe distance from window panes in winter. Small pots need to be held so they won't tip or blow over. 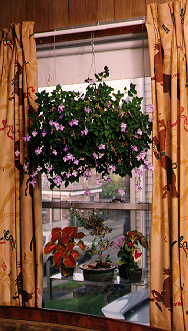 Indoor Window Plant Hangers provide an easy, elegant and inexpensive solution for these requirements. With this approach, almost everyone can grow beautiful plants year round on windows in their own home, apartment or office. Here are a few tips and suggestions. Center the bracket on the top molding of your window. Use headless nail (supplied with unit) to attach bracket on top of window molding; leave at least 1/2" of the nail above the bracket for the optional hanging basket attachment. Doing this enables optional hanging basket attachment to be used and also allows the bracket to be easily removed. Place an envelope or newspaper against wall when hammering in nail to prevent any scuff marks. Units can be hung from under a beam or from the side of a beam. This approach is ideal for the porch. Just use two small eye screws. The bracket can be set up elsewhere for rotating shelving units. Use the bracket to get proper spacing of eye screws (18 1/4" apart). Grow twelve herb plants on a standard window. Use four shelving units hung on the mounted bracket. Large herb plants should be on bottom single shelf. Make sure window does not face North. The Hanging Basket Attachment hangs on the nail in the top bracket mounted on your window molding. It is optional. You can add or remove it at any time. The loop on the optional hanging basket attachment rotates and you should turn the hanging basket every couple of days to keep all parts of the plant getting light. You can hang a basket with the store supplied hanger, or you can remove the hanger and insert your own shorter wires or use our set of 3 stainless steel wires and hang this arrangement. Replacing the hanger allows you to get the basket much higher on the window so it will look better with multiple shelving units. You can use an empty small hanging basket to hold any regular pot and turn that pot into a hanging basket plant. You can also set small hanging baskets without wires onto plexiglass shelves. If you decide not to use the hanging basket attachment with shelving units on a particular window, you can use the hanging basket attachment by itself on a second window with the small bracket included for this purpose. Position the small bracket as before and nail the same way. You can remove and replace the small bracket with a regular bracket (slipped onto the same nail) at any time. The regular top bracket can be placed on the molding of a room divider and hanging baskets may be hung from either end, using a short loop of sting, and/or from the middle of the unit by either a short loop of string or from the hanging basket attachment. Use cloth and water and mild detergent. Do not use paper towels and a harsh cleaner or you will scratch the surface of the plexiglass. Normally, 4" and 4 1/2" pots sit in holes in double shelves with a humidity tray below to catch extra water and provide humidity. Alternatively, these pots can sit on pebbles in humidity tray on single shelf. Brandy snifters for water culture can also fit in the holes in the plexiglass. Large plants (5", 6" and 7") generally look best on a low single shelf, below eye level. This way you are not looking up at big pots and you can see the top of the leaves. Place each pot in a clear vinyl saucer, with or without white pebbles in it, so that water can pour through the plant pot and not spill. Place small plants with their pots into either 4" clear vinyl pots or in regular 4" pots set in holes in plexiglass. Alternatively, a group of small plants can sit in a large clear vinyl saucer above one of the holes in the plexiglass or in a clear vinyl saucer on a single shelf. Bonsai plants sit well on single shelves with their pots in clear vinyl saucers. This way the plant does not have to be moved for watering and you can see the pot. Leave 1/2" of pot wall above the dirt or peat in the pot. Fill this area with water. If pots are set in holes in plexiglass above humidity trays, excess water automatically goes into humidity tray. Water plants every two days on average. Some plants like Azalea need to be checked daily. Alternatively, use wick watering from humidity tray. Water cacti once or twice a week. Poke a small hole in the center of large clear vinyl saucers resting above holes in plexiglass so extra water will automatically pour through saucer into the humidity tray. Use a nail to make the hole. Also put a nail hole in clear vinyl pots sitting in holes in the plexiglass just above a humidity tray. For plants on single shelves, set pots on humidity tray filled with 3/4" of white pebbles. Alternatively, set pots in individual clear saucers, with or without pebbles. Pots should not sit continuously in water. Drain excess water above pebbles or in bottom of clear vinyl containers with kitchen basting tool. If humidity trays gets too full of water you can also move a corner of the humidity tray off the plexiglass shelf and press down on this corner, pouring the water out into a sturdy container. Don't try to move shelving units with water in the humidity trays; inevitably the water in the humidity tray will spill. Instead of using a humidity tray, you can slip a clear pot under a regular pot which sets in a hole in the plexiglass. The clear pot sets on the lower shelf. There will be a safe space for water to collect from plant run-off above. You don't need to use pebbles with this approach. However, the bottom pot can easily get too full of water. When this happens, lift the top plant slightly so the clear pot below is free. Then remove, drain and replace the clear pot. Hanging baskets may be easily and quickly watered with pour through watering using the following approach. Tie a string from one of the hanging basket wires around the bottom of the plant to an "S" hook which hangs on the edge of the pot directly opposite the knotted end of the string on the hanging wire. Leave this string attached. When you water the plant, hang a little bucket (optional accessory) from the center of the bottom string. Excess water will collect in the bucket for later dumping. Move this hanging bucket around your hanging baskets, watering your hanging baskets as you water the rest of your plants. Automatic wick watering is not a good practice generally as plants get too much water. However, it can save your plants while you are away on a vacation. Stick nylon stocking strips from humidity tray into bottom holes in pot. These wicks can soak up water from the humidity tray for constant watering. Wicks can be draped over the back edge of the humidity tray when not in use, or removed. Any 4" pot filled with aggregate and a plant can be set in a clear 4" vinyl pot and the combination set in a hole in the plexiglass. Solution level is clearly visible at all times and easily refilled. If you have a sofa or chair or table and lamp in front of a window, don't use a low section of shelving on that window. Also leave off a lower section of shelving if you have a large floor plant in front of the window or if you have a cat that demands its own space on the widow sill. 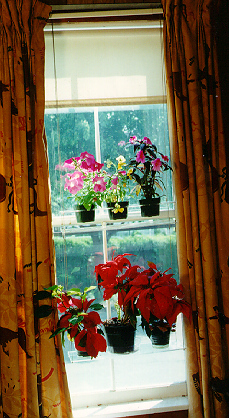 Plants can be grown year round in windows facing East, South and West. North facing windows will only work well for a few plants. Use clear vinyl pots, trays and saucers to collect excess water and serve as humidity trays. This way light can pass through these containers into the room and to the plants below. They also look much better against the window and one can see through them to the outside. This allows you to have different size plants. It is more interesting visually as well. As your plants grow, move them to the shelving units that have more space. This could be to a particular shelving unit hanging on the same window or on another window. Also rotate your plants temporarily onto the dining room table and other special interior places. You will quickly see that each window becomes a dynamic art form which changes as plants grow and as the seasons alternate. Think of each window and the collection of windows in each room as on-going sculpture in color and form whose parts work individually and collectively. Translucent window light coming through colored petals and leaves creates a three-dimensional stained glass effect. Enjoy your study of light, form, color and growth. Resonate with the seasons as you add to your collection. Learn the folklore and history of each plant so that as your collection grows, it will become a microcosm of the earth itself and its history. Start slowly by buying a few small plants. Everyone who comes into your home will experience the beauty and joy of your efforts.